Carefully remove the chicken skin from the thighs, reserving the skins for use later in the recipe. Combine the remaining ingredients of the marinade in a bowl and pour over the chicken thighs. Place in the fridge to marinate overnight. In the meantime, preheat an oven to 165°C. Place the two reserved chicken skins between two flat oven trays and cook for 10 – 20 minutes until the skins are crispy and brown. Set aside. To make the mayonnaise, whisk the egg yolks, soy, gochujang and vinegar together in a small bowl. Slowly drizzle in the grapeseed while continuing to whisk until the mixture has thickened and fully emulsified. Add a dash more of the white soy to thin it out, if necessary. Set aside. Preheat the coals of a BBQ. Remove the chicken thighs from the marinade, allowing most of the marinade to drain off. Season with salt and place on the BBQ until cooked through. Remove and set aside for 10 minutes before slicing at an angle into 3 or 4 smaller pieces. Place the bacon rashers on the BBQ and cook until all the fat has rendered, and the bacon is crispy. Remove and set aside. 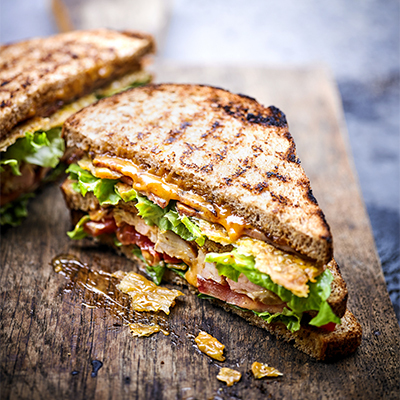 To assemble each sandwich, place one piece of toast buttered-side up and top with the rashers of bacon followed by the grilled chicken thigh pieces. Spread 1-2 tablespoons of the gochujang mayonnaise onto both sides of the centre toast and place this on top of the chicken thighs. Lay the slices of tomatoes on top of the centre toast, followed by the lettuce and then the crispy chicken skins. Finish with the final piece of toast, buttered side-down. Slice the sandwich in half diagonally and use a toothpick or two to secure the sandwich and hold it in place.